For most True Believers and Web Heads, it's been 13 years since we had fun watching a Spider-Man movie. Director Jon Watts' Spider-Man: Homecoming, the loving product of six writers and the Marvel-Sony Alliance, brings the Amazing Spider-Man home to the Marvel Cinematic Universe where he belongs - and where the fun is. No longer isolated away from his superhero playmates in his own universe where he toils and suffers as its only superhero, Homecoming shows us a Peter Parker the way he was originally conceived by Stan Lee and Steve Ditko: as a high school kid growing up in Queens, New York in a world where the Avengers exists and he can interact with them. Keen to not make the mistakes of its five predecessors starring two other Spider-Men, Homecoming goes out of its way (to Washington, DC, even) to show us a Spidey doing things and fighting bad guys we've never seen before. Hopefully, Mr. Stark is impressed. 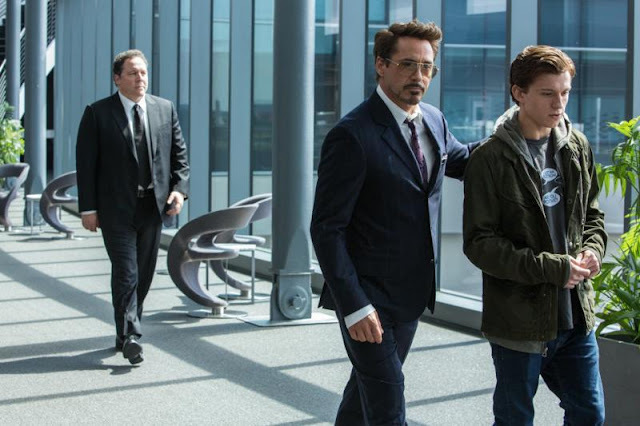 Homecoming amusingly catches us up with how Peter Parker (Tom Holland), a la his own web vlog, was recruited by Tony Stark to fight on his behalf in last year's Captain America: Civil War. We see a different side of the conflict between #TeamCap and #TeamIronMan in Berlin; through the wide-eyed excitement and naivete of the young Spider-Man. For a 15 year old kid who doesn't have a driver's license and had never left the country, being flown around on Tony Stark's private plane (no stripper pole this time) was exciting and intoxicating. No wonder upon returning home to Queens, his normal life of being the smartest sophomore at Midtown Technical High School feels lacking. Peter can't wait to blow out of those halls, don his brand new StarkTech suit, and right wrongs (and get yelled at a lot) as the Friendly Neighborhood Spider-Man (catchphrase coined and trademarked by Tony Stark, thank you very much). Peter also can't wait to report his every activity to Tony's stressed out right hand man Happy Hogan (Jon Favreau), hoping he gets the call to hang out with the Avengers. The waiting is the hardest part, so the song goes. Holland is a Peter like never before; the youngest, brashest, funniest Spider-Man we ever did see. His sense of duty to do the right thing and help out the little guy is endearingly intact. His motivations are unlike any previous iteration of Spider-Man in a movie: Homecoming, to it's credit, only references Spider-Man's famous origin in the briefest way, and we are not subjected to seeing Uncle Ben shot and the pathos that ensues, for the third time in a decade in a half. Every one knows how Peter becomes Spider-Man. What's interesting is what's lost when the Uncle Ben is thrown out with the bathwater: the reaffirmation that Peter does what he does because of the lesson that "with great power comes great responsibility." Peter articulated a version of this to Tony Stark in Civil War, which is why Tony brought him on board. In Berlin, Peter's motivation to fight was "to impress Mr. Stark." In Homecoming, that hasn't changed at all. Peter's sole goal is to shed his humdrum life and become an Avenger. Slinging webs and fighting crime on the ground are just his training wheels, but he needs that training more than he knows. In his well-meaning blunders and haphazard investigation into a crime wave involving stolen alien tech in Queens, Peter discovers a weapons trafficking operation run by Adrian Toomes (Michael Keaton). Toomes ran a salvaging operation to clean up New York City after the battle seen in the finale of the first Avengers movie, but Stark took his living away from him by establishing his own Damage Control operation through the government. Toomes began stealing technology and scrap left in the wake of the Avengers' many battles (parts of Ultron in Solokvia, weaponry from the Triskelion in DC, etc. ), refurbishing the scrap as weapons, and selling them to the black market. In his way, he's as industrious as Tony Stark, if his personal accumulated wealth is more modest by comparison, and Toomes has his own winged flying suit, making him the Vulture (no one calls him that). Toomes even has his own evil Avengers: a group of criminals like the Shocker (Bokeem Woodbine), the Tinkerer (Michael Chernus), and the Scorpion (Michael Mando), updating Spidey's rogue's gallery we haven't seen yet in the movies from the original comics. Unlike Stark, Toomes is a family man, which, in the third act, suddenly makes the Vulture's issues with Spider-Man a lot more personal. Peter's explanations for his disappearances and unexplained absences is his "Stark Internship," a sly shorthand for "Peter is doing a lot of stuff Iron Man does." As a 15 year old Millennial (or whatever Peter's generation, born after 9/11, is called) Peter is comfortable with and dazzled by tech. With StarkTech, he has the best of the best: his new Spider-Man suit comes with flying drones, Iron Man-like Heads Up Display, and its own A.I. (voiced by Jennifer Connelly, a brilliant casting choice as she's the wife of Paul Bettany, who once voiced Iron Man's A.I. Jarvis and graduated to becoming the Avenger called the Vision). "Suit Lady," or Karen as Peter eventually names her, talks him though his latest exploits and bungles. Peter is never brought so low as when, after disabling the tracker in the suit, his inexperience causes the Staten Island Ferry to be ripped in two, and Iron Man has to save him and scold him. Iron Man saves him twice, actually, and later takes his suit away. Unlike Tony Stark, Peter doesn't need StarkTech to be Spider-Man, and while that's ultimately the point of the movie - Spider-Man learns he isn't Iron Man, doesn't need to be, and his dream of being an Avenger can wait another, oh, 10 months or so according to Marvel's move release schedule - it takes the entire length of Homecoming to reach that conclusion. Meanwhile, as Spider-Man tries to ground the Vulture, Iron Man: Homecoming was happening all around him: the Avengers are somehow back in business after Civil War (Spider-Man was to be the newest recruit unveiled to the adoring public) even though the fugitive Captain America (Chris Evans) is "a war criminal," and even Gwyneth Paltrow walks back on as Pepper Potts, her broken relationship with Tony Stark healed magically off screen. As Tony Stark, the recognized kingpin of the Marvel Cinematic Universe, Robert Downey, Jr. lords over all his scenes with or without Tom Holland. There are plenty of times, such as when Spider-Man, clad in his original homemade suit, clings to a Stark Jet thousands of feet in the air, and battles for his life against the Vulture, that we end up wondering if Iron Man will come and save him yet again. If Marvel wants to make Iron Man 4, they should just make Iron Man 4. It seems like blasphemy to suggest, but less Tony Stark is more Tony Stark in a Spider-Man movie. Still, what Spider-Man: Homecoming delivers for most of its running time is the sheer giddy joy of seeing Spider-Man back in action, this time in the Marvel Universe. Peter's high school life and his classic cast of characters from the Lee/Ditko comics are updated into a multiracial gaggle of teens reflective of what a high school in Queens would look like in 2017. There are numerous jokes that land with aplomb, including a callback to the famous kiss in the first Sam Raimi Spider-Man that tears the house down. If only Peter took more time to enjoy his school chums like Liz (Laura Harrier), Michelle (Zendaya, criminally underused with a reveal that lands with a "huh? "), and even Flash Thompson (Tony Revolori) more. Peter does spend quite a bit of time with his first ever annoying endearing no, annoying sidekick, Ned (Jacob Batalon) - too much time, really. Ned wants to be Peter's "man in the chair" superhero support and Peter doesn't have the heart to tell him his suit already comes with an omniscient A.I. "Suit Lady." There is pleasingly a Homecoming Dance in Spider-Man: Homecoming, but Peter spends nary a moment at the dance with Liz, the most beautiful girl in school. Despite his schoolboy crush on Liz, this young Peter isn't the romantic Spidey his two predecessors were, and it is nice to see a Spider-Man not pining for Kirsten Dunst or Emma Stone ad nauseam. Besides, there's no time for love, Mr. Stark (though Mr. Stark would very much disagree). There's a lot of laughter, fun and heroics to be had in Spider-Man: Homecoming, a Marvel movie dedicated to showing us a Spider-Man doing things we've never seen Spider-Man do in a movie before, but the main lesson we and Peter take away is that this is Iron Man's world and Spider-Man is living in it.